After releasing the highly polished Vulnerable (II) in 2013, The Used are back with "The Ocean of the Sky" a 5 track EP which has appeared out of nowhere. 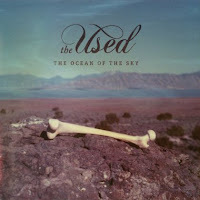 Things get off to a good start with "Iddy Biddy" which has The Used's trademark singalong chorus and crunchy guitars. "Quixotica" is a beast of a song with it's feedback drenched swagger, pounding drums and unhinged vocals. The record slows pace for the plodding "Thought Criminal" before launching into the title track which has a fuzzed out guitar tone reminiscent of the Black Keys. The EP is rounded off with the 20 minutes (yes 20 minutes) ambient instrumental "Tethys" with its electronics, loops and ethereal noises which does not really fit in with the rest of the EP. Gone is the glossy production of Vulnerable replaced by a gritty almost live sound with the exception of "Tethys" which feels like a whole different EP in itself. This is the sound of a band having fun and experimenting to great effect, whether some of the elements will make it through to their next records will depends on the fans reaction.